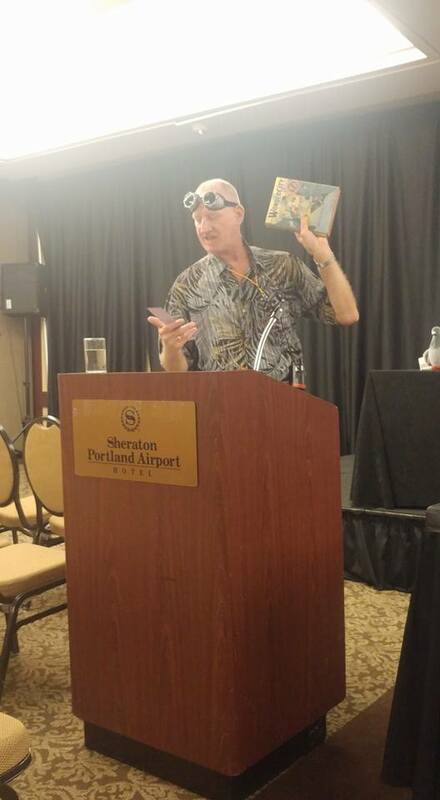 I’m back from OzCon International 2017 (sometimes still called the Winkie Convention) in Portland, Oregon. 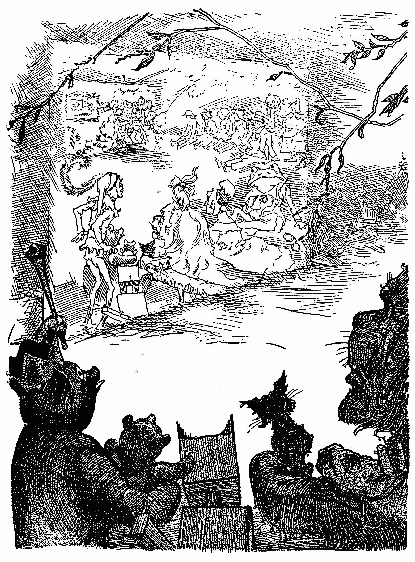 The main theme was The Lost Princess of Oz, and the location because Ozma was Ore-gone. No, I’m actually not sure why that location was chosen, but it’s the same as it was last year. Next year’s convention will be held in Pomona, California. 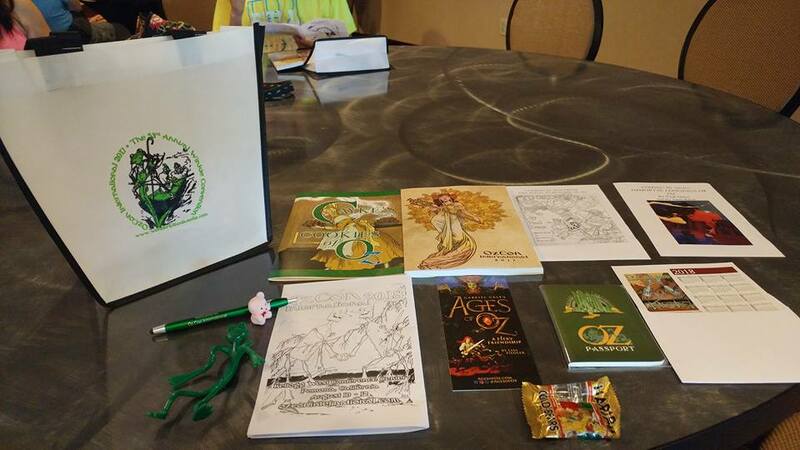 But anyway, I flew in on Thursday, checked into my room, and helped to stuff the gift bags for attendees. Beth had gone with me last year, but wasn’t able to this time. The bags included a program with some essays, a little bendy frog, a tiny pink bear, and some gummy bears. The official start of the convention was on Friday morning, and I had trouble sleeping despite having been on the plane for so many hours. It was kind of like Christmas as a kid, honestly, and it’s not a feeling I have very often. Normally being able to sleep for long periods of time IS the exciting part. The first panel I attended was about the Emerald City television show, which I never watched, but that was the only one at the time. Much of the time there were two tracks of programming running at the same time, which I generally prefer, but it does occasionally mean missing something interesting. 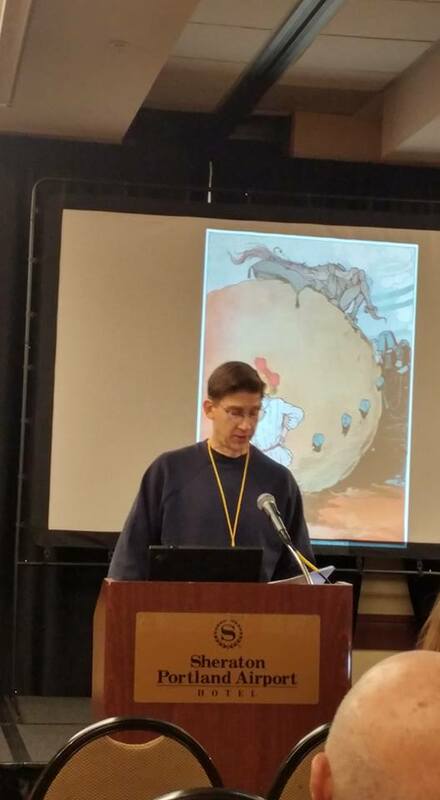 Jared Davis then gave a talk on Ted Eshbaugh, who made the first animated short based on Oz. We watched that and a few of his other cartoons, at least once they got the audiovisual equipment working. It would have been nice if we’d had access to the Lavender Bear’s magic wand, but I guess that didn’t have sound capability. 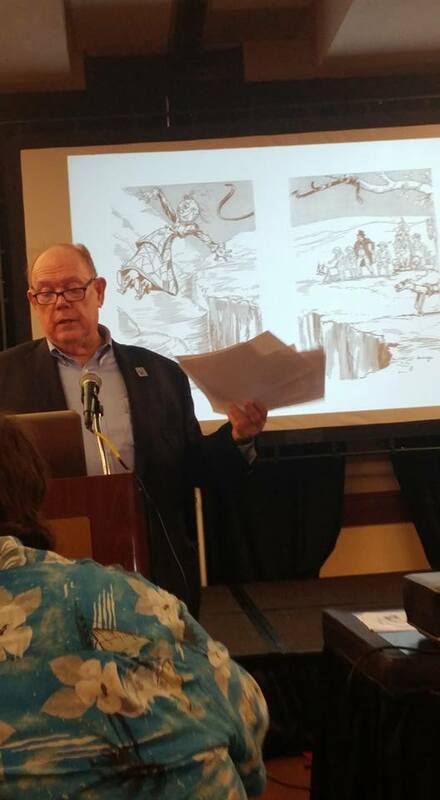 Convention chairman Lee Speth led a talk on Ozma that brought up some points I hadn’t considered before, including how the Nome King’s ornament rooms were likely inspired by ancient Egyptian tombs. 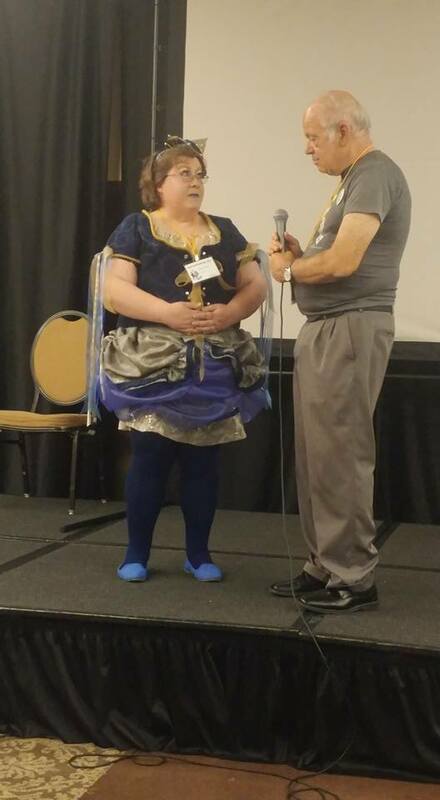 I bought Robin Hess’s newest Oz book, The Spelling Bee of Oz; and then attended an Oz version of the BBC radio game show Just a Minute hosted by Eric Gjovaag. Paul Dana had recommended I participate in it, but I ended up not doing so because I really didn’t have any idea what I’d be in for. You’re supposed to speak on a topic for a minute without hesitation, repetition, or deviation. I tend to hesitate a lot even when at my most confident. 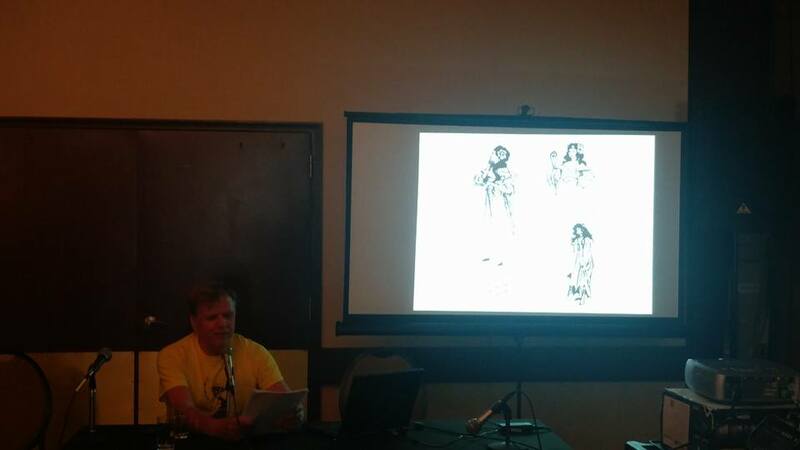 That evening, the program consisted of Peter Hanff giving an overview of Lost Princess, Colin Ayres discussing various Oz cartoons, and Doug Aberle’s reminiscence on animating the Nomes in Return to Oz. I’d seen several of the cartoons before, but not all of them. Aberle’s panel largely consisted of a video he made about his experiences, and I grew up in the era when Claymation was at its height, so that was fascinating. He mentioned having worked on A Claymation Christmas, another Will Vinton production. I’d seen Return before reading any of the Oz books, and I was a bit surprised by how different L. Frank Baum and John R. Neill’s Nomes were from the Claymation ones. Ozma of Oz does suggest that Nomes look like part of the rock and can phase through it, but later books with Nomes tended to veer away from that and instead just make them rock-colored humanoids. Sherwood Smith did do a bit of a nod to the moving through rock by making it a special power of Rikiki’s that took some effort on his part. 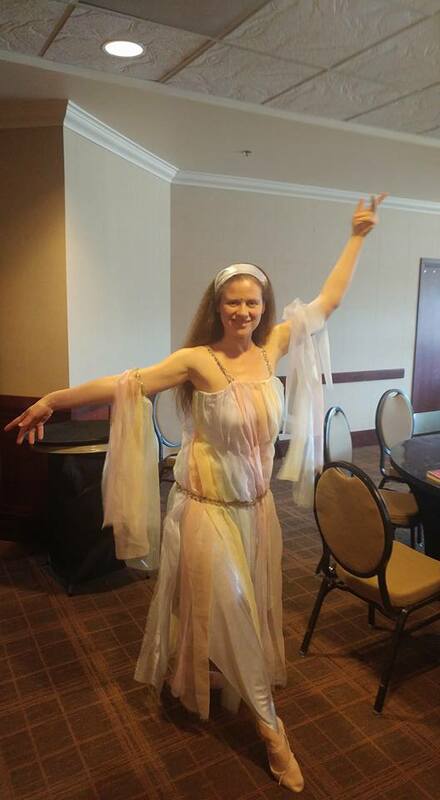 The after party featured a drink called Ozma’s Enchantment that included peach and rum. 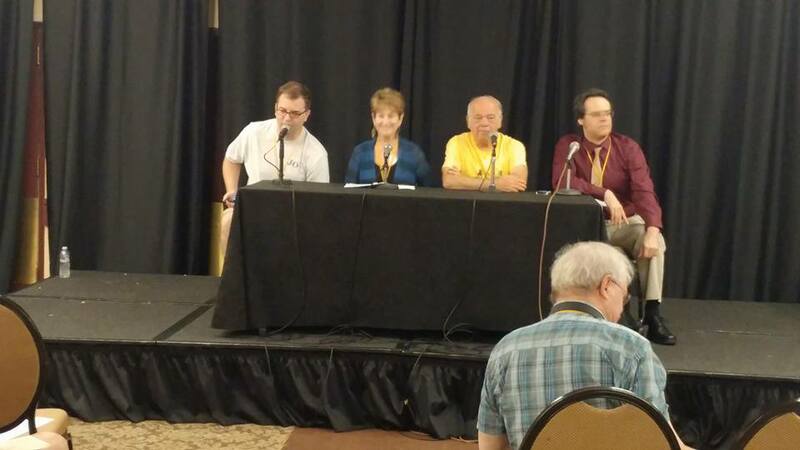 Saturday’s program started with the quizzes, and there were four of them: one based only on Lost Princess, one on the fourteen Baum books, one on the MGM movie (new this year), and one on all forty books in the main series. I wrote the last one, but don’t recall being told that I needed to provide a prize, so I guess I still owe Susan Hall something for winning. I’ve been informed my quizzes tend to be hard, and I did include a few obscure questions, but for the most part I can’t tell because I don’t know what other people remember. I have a mind for details from books and such, but sometimes someone else will bring up a detail I didn’t recall. 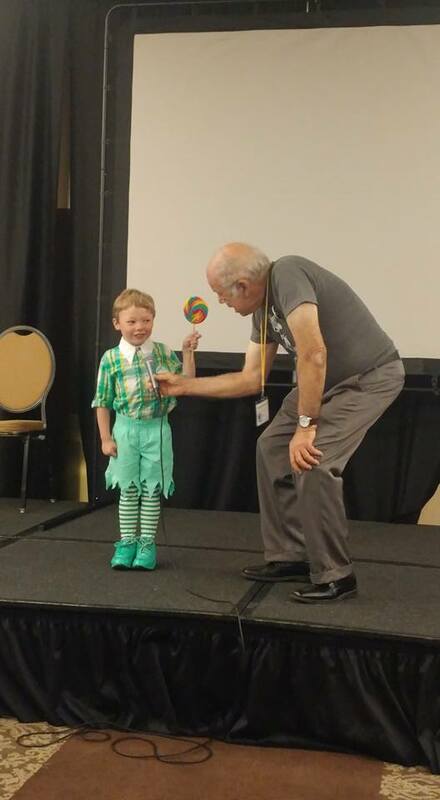 Eric Shanower gave a talk on Nomes that I think was pretty much the same one he gave some years ago in Delaware. The International Wizard of Oz Club auction went on for most of the day, and I did manage to obtain some fairly cheap copies of Ruth Plumly Thompson Oz books. Not great-quality copies, but still hardback, and some with the color plates. David Maxine talked about the publication of Eloise Jarvis McGraw’s last Oz book, Rundelstone, and her daughter Inanna was on hand to sign copies of the books she co-wrote with her mother. I had Merry Go Round signed, but I wish I could get another copy of Forbidden Fountain, as mine is in poor shape. The Club actually reissued it in standard size a few years ago, but didn’t print that many copies. I also picked up the version of The Life and Adventures of Santa Claus illustrated by Eric Shanower, and while I have some things to say about his illustrations, I might wait until it’s more seasonally appropriate. 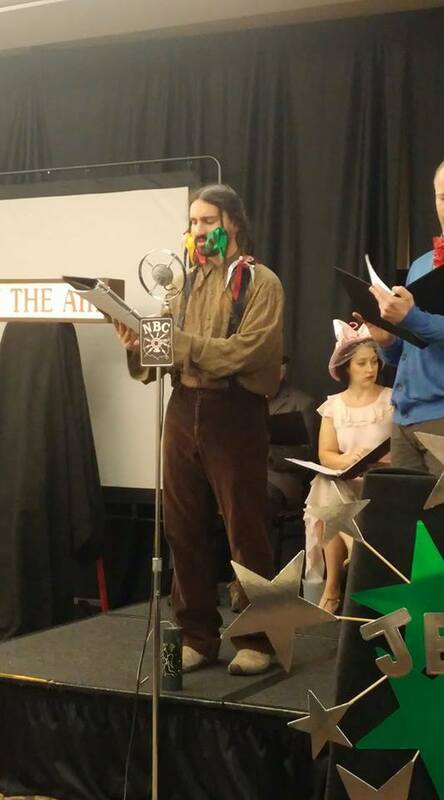 The costume contest had some excellent entries, including a group reenactment of Lost Princess to follow up on the one of Bilbil’s disenchantment in Rinkitink from last year. 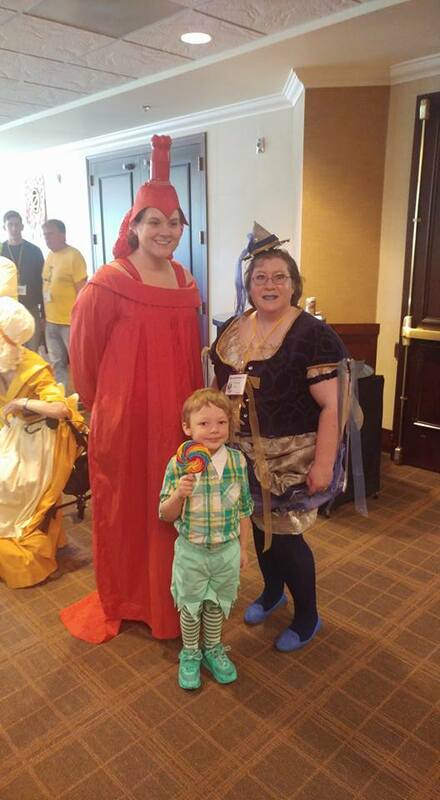 Other costumes included Jinjur, Polychrome, another Frogman, a Lollipop Guild member (the only child entry, and he nailed the song), and Mrs. Sew-and-Sew from the Munchkin Sewing Guild. 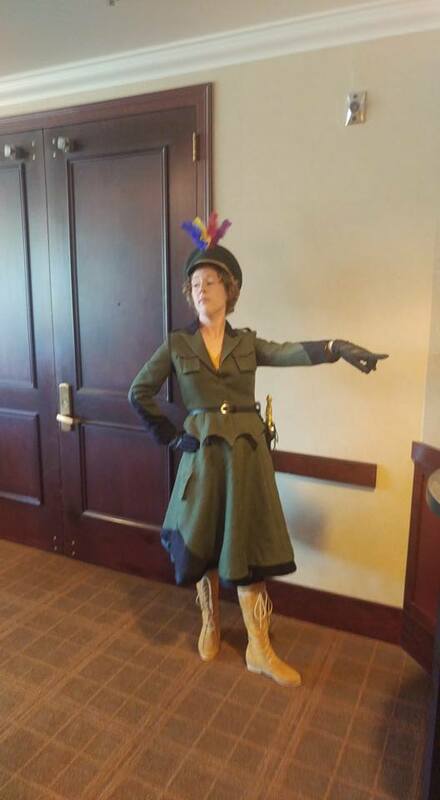 This last was an original character; the name was used in Grampa for the Queen of Ragbad (well, I guess it was technically a nickname, but we never learn her given one), but the cosplayer hadn’t yet read that book. 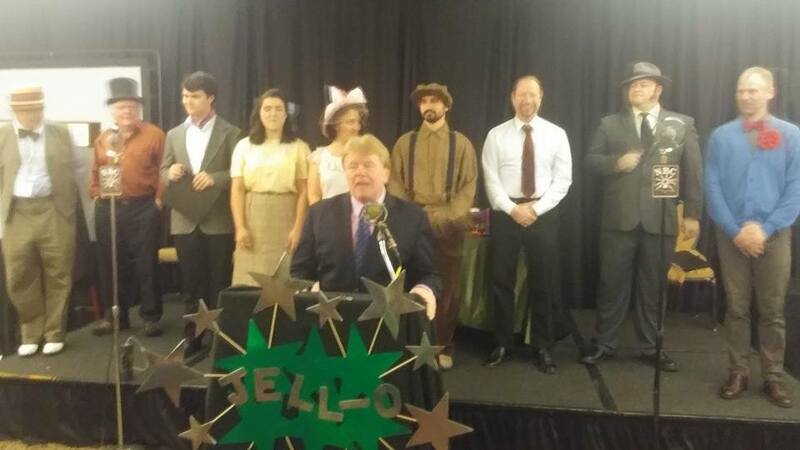 The banquet followed, and then an evening program that was largely taken up by a recreation of the Jell-O Oz radio show from the 1930s. The episodes we heard were from the adaptation of Dorothy and the Wizard that brought the Scarecrow, Tin Woodman, and Cowardly Lion along on the journey. The play’s version of Jim the Cab-Horse had a habit of mispronouncing words, allegedly because he wasn’t used to talking. It was very entertaining, and most of the actors switched back and forth between characters. The guy who played Jim was also the Braided Man, revealing hair braided with colorful ribbons that he’d previously kept under his cap. The Tin Woodman and Lion had voices partially inspired by their MGM portrayals, and of course the movie hadn’t come out when these plays were performed on the radio, but it still worked. Actually, the Tin Man voice came across as reminiscent of Scott Thompson from the Kids in the Hall. I find it kind of interesting that Jell-O sponsored this show when Ruth Plumly Thompson wrote a fantasy poem for Royal Gelatin. John Fricke informed us that, after the Oz program was canceled, Jell-O switched their sponsorship to Jack Benny. Sunday was pretty low-key, with a lot of people going on the Columbia River cruise. I had gone last year, but didn’t this time. There was an interesting discussion on Baum’s last four Oz books and how they differed from the others. I didn’t read the books in order, but I was mostly aware of the order, and I can tell you that on my first readings I found most of these not as much pure fun as the earlier ones, but very clever and inventive. I noted that the amount of verses, puns, and rapid-fire jokes decreased considerably, likely because Baum was no longer writing with an eye for the stage, but perhaps also signs of a somewhat darker outlook on his part. After the convention ended, I had a lot of time to kill, and took the Max into town to go to Powell’s City of Books. 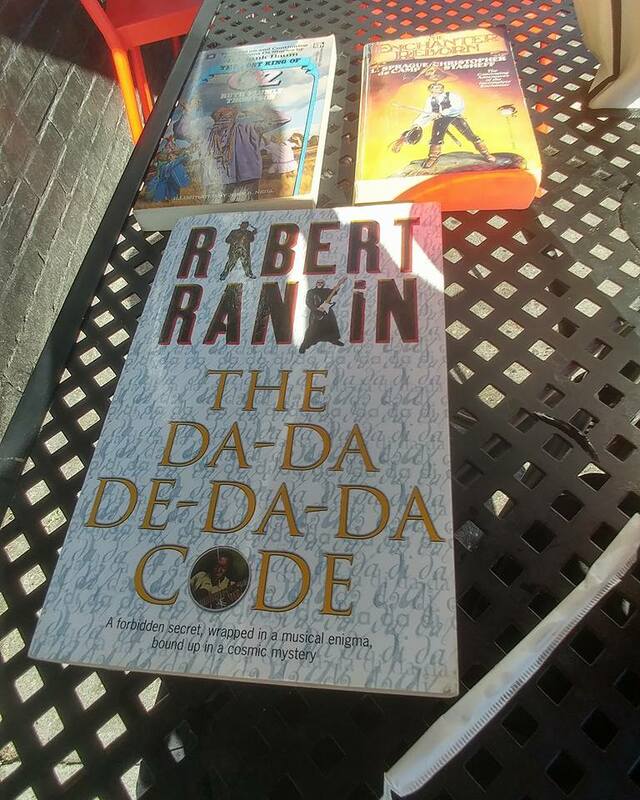 There’s so much stuff there that it’s overwhelming, but I did pick up a new Del Rey Lost King, a copy of a book that included L. Sprague de Camp’s Harold Shea/Oz crossover, and Robert Rankin’s The Da-da-de-da-da Code (no relation to Oz with that one, at least as far as I know). Then I ate at the pizza place across the street, Sizzle Pie, which Jared had recommended. Now I’m back home after an overnight flight, and my schedule is all messed up. As far as future Oz content, I’ll probably be finished Spelling Bee and the 2016 Oziana pretty soon, so expect reviews of those. 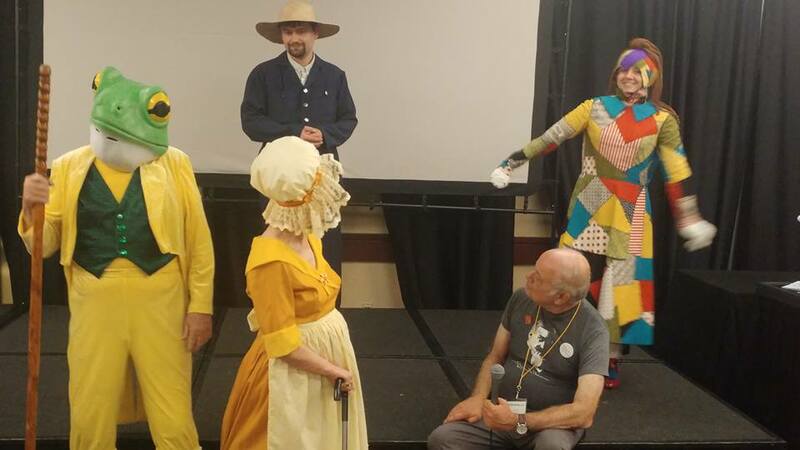 There were a few other topics discussed at the convention which might also serve as jumping-off points, but I’ve probably already written about most of them. 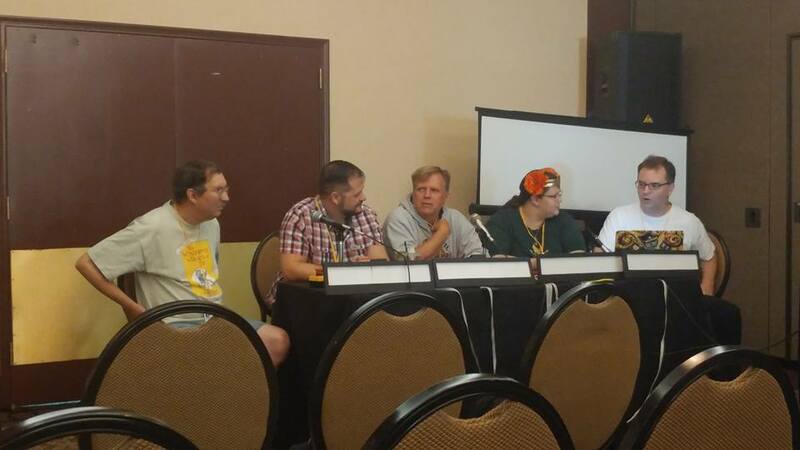 I was rather pleasantly surprised that some people actually wanted to talk about Oz outside the panels, although that certainly wasn’t the only thing that came up. This entry was posted in Cartoons, Characters, Eloise Jarvis McGraw, Eric Shanower, Humor, Jared Davis, John R. Neill, L. Frank Baum, Magic Items, Oz, Oz Authors, Plays, Ruth Plumly Thompson and tagged claymation, david maxine, doug aberle, eric gjovaag, inanna mcgraw, international wizard of oz club, john fricke, nomes, ozcon international, ozma of oz, return to oz, robin hess, sherwood smith, ted eshbaugh, the lost princess of oz, will vinton, winkie convention. Bookmark the permalink. Man, I have family in Oregon now; if I bothered to keep track of conventions, I would have had a decent excuse to attend this one (though crippling anxiety might have kept me away regardless). The Oz Club sends out notices about the conventions, even though they’re not officially in charge of the West Coast ones anymore. That’s how I generally find out about them.